US Senate candidate from Texas Ted Cruz has an opponent that’s hard to find. For over two weeks, Cruz has been asking his meek opponent, Lt. Gov David Dewhurst, for a debate. At issue is whether Dewhurst called for an income tax. Why is Dewhurst ducking a debate? In 2006, David Dewhurst publicly supported a business income tax, as an alternative to Rick Perry’s Gross Receipts Tax, but then stepped back from that the next day to support the GRT being favored by several business groups. The Texas Constitution forbids a personal income tax, and the business tax was perilously close to that. Dewhurst had to back away from the statement. Many conservatives pushed for spending cuts, rather than tax increases. A Gross Receipts Tax is far worse than an income tax, however. A GRT punishes businesses with high sales volume but low profit margin, also punishing with higher prices the customers of those businesses. The end result of a GRT is a series of market dislocations and disruptions. Short-sighted business leaders supported a GRT because it would have lowered their immediate tax burden, given the other tax changes the state was about to make. The savings would have quickly disappeared, however, as revenue-hungry spenders in the legislature found new ways to dispose of the money they already received through the GRT. 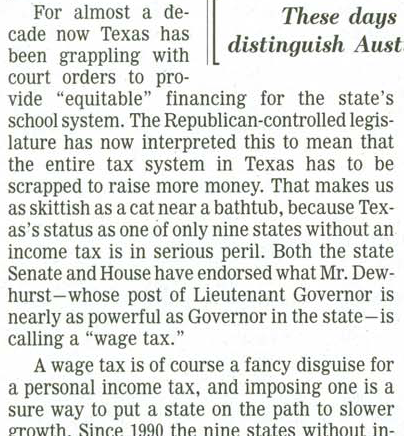 But as early as 2005, Dewhurst had supported a “wage tax”, which would have taxed employers based on the wages they paid. The Wall Street Journal called that an income tax, which again is unconstitutional in Texas..
Fast forward to 2012, and Ted Cruz wants Dewhurst to explain the difference between a wage tax and in income tax. Though employers can’t do what they’d like to do, which is cut wages to make their overall labor costs stay the same, without alienating their workforce, “The employer will pass it on in future pay,” he said. But now Ted Cruz has been asking, these last two weeks, for a debate with Dewhurst over whether the “wage tax” is actually an income tax.